Golf! The game of the American business people. Some say more business happens on the golf course than in the office. No better way to make sure that work gets done on the course than by providing your customers and clients with personalized golf merchandise such as golf balls, tees, and clubs, or golf caps, gloves, and umbrellas. With logoed golf products you can make sure that business continues even when you or a company representative can't make it for tee time. Logoed ad specialty golf merchandise is such a great investment simply because the odds that your clients play golf is so high, which guarantees use. 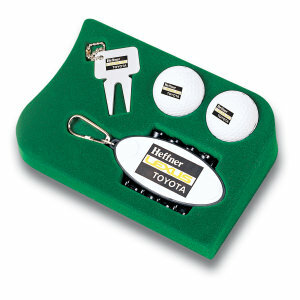 Promotional golf items from IASpromotes.com build brand recognition at themed marketing events, golf tournaments, trade show booths, and as golf sales incentives. Their small size makes these imprinted promotional golf merchandise easy to distribute, but their high demand and frequent use makes a big impact. We offer promotional items from the top golf brands, making any custom printed golf product perfect for either the first time golfer or long-time golf enthusiast. Call us at 1-800-780-1962 to speak to a specialist who will be happy to help match a golf related promotional product to your event budget and target audience. Maybe your clients are new to the game or maybe they just never quite mastered the perfect swing. That doesn't mean they can't look and feel great out on the course. 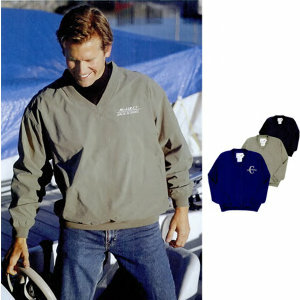 Give them a little help with custom imprinted wind shirts, rain ponchos, golf gloves, and golf caps. No one really cares who wins or loses out there, but no one wants to look out of place. So when they're out on the green, make sure your clients look like pros in your promotional golf apparel. And if your clients are pros, make sure they look as good as they are. For the novice and the experienced golfer alike, IASpromotes.com's selection of personalized golf apparel is sure to leave your customers satisfied and your promotional merchandise appreciated. The wonderful thing about promotional golf merchandise is that to play the game you need so much gear! That gives you so many options for building brand recognition. Maybe you want to start small with custom printed golf balls or promotional golf tees. 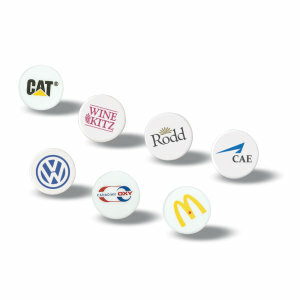 Personalized ball markers, golf tags, and divot fixers are also great promotional items that are sure to get your logo noticed over and over again throughout the round. 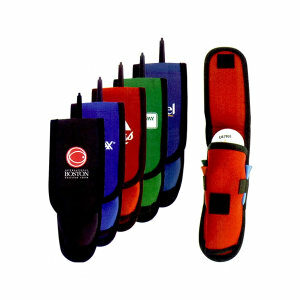 And if you can't choose just one custom golf item, take a glance at our selection of useful promo golf kits. 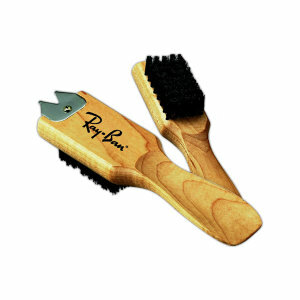 br> Perhaps you need a promotional gift or giveaway that is a little more substantial. Consider custom-printed golf clubs or golf bags. These truly provide consistent brand recognition. With each swing your brand, logo, or tagline will gain more and more attention. But don't stop with just the customized golf bag! Don't forget the embroidered golf towels, golf ball bags, and cleaning accessories. After all, you want your customers to always know that your company is there to clean things up when they get a little messy. IASpromotes.com knows how serious golf is to the corporate world. That's why we offer the best promotional products in the industry. You can custom imprint, screen, or embroider your logo and tagline onto the brands everyone knows and loves, such as Titleist, Adidas, Wilson, Nike, and Pinnacle. Choosing the right brand and quality shows your customers that you care not just about providing them with a promotional product, but making sure they have the best round of golf they possibly can. How Do I Choose the Right Promo Golf Gear? We know, with so many customized golf options, it can be difficult to decide what is the best use of your marketing dollars. Consider your clients. Are they already familiar with your brand or are you trying to make a great first impression? Are they golf fanatics or just occasional participants? Are these ad specialty golf items for a promotional giveaway, a tradeshow, or a special corporate gift? Answering these questions can help you decide how much space you want your logo and tagline to have, and what quality and type of personalized golf items your clients may truly need and use repeatedly. If you're still not sure, contact one of our professional merchandise specialists. We know these products like the back of our hands and can help you pick the advertising golf merchandise that is right for your target market. Just live chat, call, or email us, and we'll help with all the decisions and details.